ATLANTA – Today, the Atlanta Tipoff Club announced the finalists for the 2019 Werner Ladder Naismith Men’s College Coach of the Year Award, featuring the 2018 honoree and three potential first-time winners. The finalists include Rick Barnes (Tennessee), Chris Beard (Texas Tech), Tony Bennett (Virginia) and Kelvin Sampson (Houston). Barnes would become the first Tennessee men’s coach to win the award, adding to the five honors held by former Lady Vols coach, the late Pat Summitt. Only four schools—Virginia, Duke, North Carolina and Stanford—have winners of both the men’s and women’s Werner Ladder Naismith Coach of the Year honors. Beard seeks to become the fourth Big 12 coach to claim the award, following three coaches from Kansas (Bill Self, 2012; Roy Williams, 1997; and Larry Brown, 1988). Bennett, who won the award in 2007 at Washington State and in 2018 at Virginia, would be the first back-to-back winner in the history of the men’s award and would join Mike Krzyzewski and John Calipari as the only three-time winners. Sampson would also join Calipari as the only other coach from the American Athletic Conference (The American) to win after Calipari took home the trophy for Memphis in 2008. Fans will be able to support their favorite finalist by visiting naismithtrophy.com/vote between March 22-April 3 to cast their ballot, and the fan vote will account for five percent of the overall final vote. Fans may also vote by visiting the @MarchMadness Twitter page on March 23 and March 26, to vote for their favorite men’s coach of the four. Then, on April 7, 2019, the 2019 Werner Ladder Naismith Trophy for Men’s College Coach of the Year will be awarded at the Naismith Awards Brunch presented by Mortenson, during the Final Four in Minneapolis. • For the first time in program history, Tennessee has spent the entire season ranked in the top 10 of the AP Top 25, including No. 1 for four weeks. • Under the leadership of Barnes, the Vols have won a school-record of 19 consecutive games this season. McGuire, Rick Pitino, Eddie Sutton and Roy Williams. • He has led the Vols to become the No. 2 seed in the South Region of the NCAA Tournament. • Beard led the Red Raiders to a 26-6 record and a regular season Big 12 co-championship. • He was named Big 12 Conference Coach of the Year. • In his second season as head coach, Beard led his team to the Elite Eight, where his team lost to the 2018 NCAA champions, Villanova. • His Red Raiders are the No. 3 seed in the West Region of the NCAA Tournament. • Bennett led Virginia to a 28-2 regular season record and the team’s fourth Atlantic Coast Conference (ACC) regular season title in six years, which they shared with North Carolina. • He was named ACC Coach of the Year for the fourth time. • Bennett coached the Cavaliers to an ACC record with five ranked road wins this season. • His team heads into the NCAA Tournament as the No. 1 seed in the South Region. • Sampson was named The American Coach of the Year for the second-straight year. • His team reached the top-10 in the national rankings for the first time since the mid-1980s. • Sampson’s Cougars are the No. 3 seed in the Midwest Region of the NCAA Tournament. 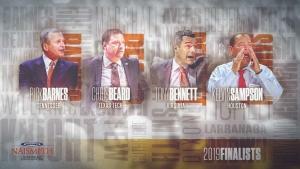 The four finalists were chosen by the Atlanta Tipoff Club’s national voting academy, comprised of leading journalists from around the country, current and former head coaches, former award winners and conference commissioners, all of whom base their selections on outstanding coaching performances during the 2018-19 college basketball season. The vote was tabulated and certified by Aprio, a premier, CPA-led business advisory firm.